I tagged along with the Wine Goddess (my wife Mary Lee) on her recent Costco shopping excursion when I saw this gem in the wine section: Kirkland Signature Willamette Valley Pinot Noir 2016. She said she was buying salmon for dinner, so I went ahead and put this bottle in her cart. I’m glad I did. The Oregon red turned out to be a pleasant surprise for the $12.99 price. Coming from the Willamette Valley, where Pinot Noir is king, the Kirkland brand is no slouch for an every-day, easy drinking wine. The color was a bit duller than the normal ruby shade that I prefer, yet that was my only complaint. It was mildly fragrant in cherry and plum, and both descriptors carried over onto the palate in a juicy, silky quaff. There was a nice zip to the flavors too, a spicy cinnamon note that extended through the medium length finish. Hey, for the money, I could drink this with a satisfied smile any time. It paired well with the pink salmon, mushroom ravioli (from Trader Joe’s) and semi-charred Brussels sprouts. For those uninitiated to the Kirkland Signature brand, it is the private label of Costco. The company takes wine seriously. Kirkland employs its own winemakers, purchases grapes from top-notch growers and maintains production facilities across the globe. Sarah Cabot is the winemaker for Kirkland’s Willamette Valley Pinot Noir and to call her atypical is an understatement. She has a degree in jazz composition from the Berklee College of Music, drives a pickup truck, and reportedly cusses in the corporate board room when making a point to executives. She’s also very passionate about crafting Oregon wine. While she previously made her mark crafting small production, artisanal wines that did quite well, Cabot’s now head of winemaking for Precept Wine’s Oregon portfolio, which includes the Kirkland Signature Series Pinot Noir brand. For Cabot, it was a big jump going from producing 5,000 cases of wine per year to over 100,000 cases at Precept, yet she’s thrived on the transition. 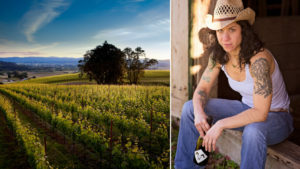 In an article written by Kathryn Cole for the SevenFiftyDaily (https://daily.sevenfifty.com/tracking-sarah-cabots-journey-from-micro-to-costco/), Cabot says the larger corporate environment has given her a greater opportunity to experiment with wine-making techniques and unique grapes. And while she still makes fine wine for the boutique house Battle Creek Cellars, Cabot said she understands the importance of creating excellent mass market wines. Cabot’s on a mission and I’m sure she’ll succeed in the years ahead. That’s good for wine lovers. It also lends more credence to Kirkland Signature wines sold at Costco, the nation’s No. 1 wine seller. Winemakers like Sarah Cabot are dedicated to improving quality – that’s how they roll – and they won’t rest on their laurels because each vintage represents only one chance a year to make a better wine. There can’t be any wasted efforts in this highly competitive game. So I recommend that you get started on charting Sarah Cabot’s progress by trying Kirkland’s 2016 Willamette Valley Pinot Noir. It’s a good buy. Two recent additions to Costco stores worth checking out are Kirkland Signature NV Champagne from France ($22.99) and Kirkland Signature 2016 Rutherford Cabernet Sauvignon ($17.99) from Napa Valley. I’ve tried the champagne and it is a creamy, bubbly delight selling at a remarkable price point compared to high-end French sparklers. To stay current on Kirkland wines, go to CostcoWineBlog.com and sign up for the company’s newsletter. It’s New Hampshire State Wine Week (Jan.20-26) and all liquor and wine outlets are offering fabulous discounted deals on top selections. You can mix and match a case of 12 bottles and receive an extra 15 percent off. A number of wine industry celebrities are in Granite State stores presenting seminars and meeting customers. They include Randy Ullom, winemaster at Kendall-Jackson; Marilisa Allegrini, CEO of Allegrini Estates; Cynthia Lohr, marketing VP at J. Lohr; and NBA legend Isiah Thomas of Chuerlin Champagne. For a listing of events, go to NHWineWeek.com.